Harvard scientists have taken a critical step toward building a quantum computer— a device that could someday harness, for example, the intrinsic properties of subatomic particles such as electrons to perform calculations far faster than the most powerful supercomputers. As a first step toward making those parallel computations possible,researchers working in Yacoby’s lab have established a new method for creating an entangled state between two qubits. 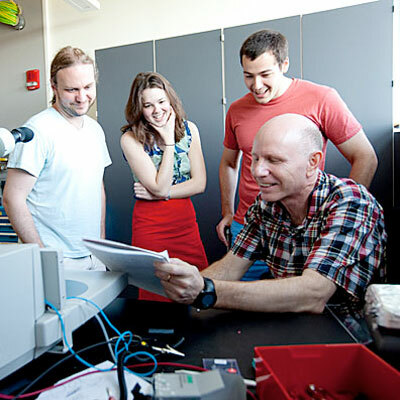 By taking advantage of the electrostatic interaction between the particles, Yacoby, in collaboration with postdoctoral researchers Oliver Dial and Hendrik Bluhm, and graduate students Michael Shulman and Shannon Harvey, was able to create pairs of qubits in a state that has no classical analog, known as an entangled state. “There are two elements to this paper,” Yacoby explained. “The first is determining how to create these entangled states. We took advantage of the fact that our qubits are made of electrons, so we used their electrostatic interaction to create this conditional, or entangled,state between them. As a method for creating entanglement, that has not been demonstrated before. The method has two benefits, Yacoby said. First, allowing a pair of qubits to interact builds the necessary entanglement between them.Second, bringing the bits back to their initial state preserves the data that had been coded into them. Similar to traditional computers, Yacoby’s design for a quantum computer begins with a thin wafer of semiconducting material — in this case gallium arsenide — “grown” in the Weizmann Institute. Researchers then deposit nanometer-size wires onto the wafer to form metal “gates.” The entire device is then supercooled to a few hundredths of a degree above absolute zero to slow the motion of atoms in the wafer. When attached to an electric voltage, the gates trap electrons,allowing researchers to construct their quantum bits.